Mounting debts and a slow economy have made the repayment of loans an uphill task for most debtors. Debts may spiral out of hand especially when faced with unforeseen incidences, such as the loss of a job or significant hospitalization. There are many options to bail you out of these tight spots, such as debt management plans, refinancing options, and bankruptcy. If assets are at rock bottom and there are no immediate solutions to make the loan payments, then bankruptcy could be the only choice for many. Most consumers file for Chapter 7 bankruptcy which provides a fresh opportunity for the lenders as it wipes off a lion’s share of unsecured debt. Chapter 7 bankruptcy is an ideal option for those with limited or no income to pay off the severe debt they find themselves in. 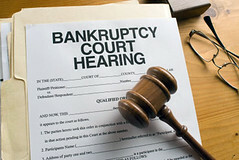 There are many benefits of filing a Chapter 7 bankruptcy, which can be completed within 3-6 months from the filing date. Once the process is concluded, the debt will be removed and the lender can start afresh. This also provides the borrower with immunity from the nagging calls coming from creditors in their attempt to collect the debt as well as ending the possibilities of repossession and other foreclosure proceedings. Chapter 7 can be filed easily and typically includes the petition, schedule of debts, a statement of finances, and a listing of property and assets. Once accepted, a meeting with the trustee assigned to the case is conducted. Normally the cases are closed and the debt discharged (wiped out) within four months from the filing date. With the discharge, all debts are erased from credit history. Chapter 7 bankruptcy is often the simplest option to eliminate debts. It is recommended to engage a lawyer who can ensure the bankruptcy papers are filled properly and the procedure of bankruptcy is completed swiftly. Filing Chapter 7 bankruptcy also protects you from any collection procedures initiated by creditors, which in turn allows you to safeguard valuable possessions. Chapter 7 bankruptcy is thus designed to remove unsecured debts and is well suited for debtors with heavy unsecured debt. It’s a perfect option for those who have minimal properties, merchandise, and material objects of value but wish to retain essential items such as a car or home. Having a bankruptcy attorney by your side will help protect your financial position by showing the court chapter 7 bankruptcy is the most feasible option in combating your dues. 1 Comments to "Advantages of Filing for Chapter 7 Bankruptcy"
After my chapter 7 bankruptcy, I was able to raise my credit score after I got a couple of secured credit cards who reported to the credit bureaus. Great article and thanks for the write-up! Post a Comment to "Advantages of Filing for Chapter 7 Bankruptcy"